Today I welcomed guest Ros Miller to the program. 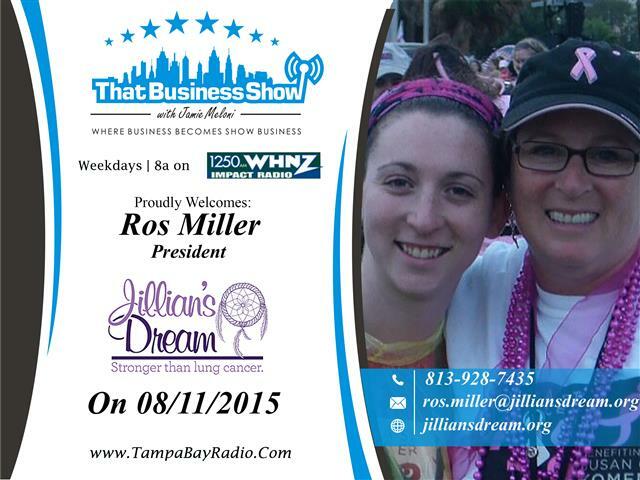 Ros is the mother of Jillian Miller who lost her battle with stage 4 lung cancer in May 2013. After Jillian’s passing, Ros was inspired to launch the non-profit organization, Jillian’s Dream to help raise awareness and funding for lung cancer research. Ros opens the segment with the story of Jillian and how the disease was detected in her body. Jillian was not a smoker, nor was she around smokers, and the disease was found due to a swollen lymph node. Upon further testing, the doctors determined the cancer had spread to the lymph nodes after originating in the lungs and she was at the late stages of lung cancer, a disease with a very high mortality rate. Ros explains how the disease carries a stigma due to its association with smoking and that it translates into reduced funding and research due to this misconception. Many young people are afflicted with the disease and it surpassed breast cancer as the #1 cancer killer of women in 1987. 1 in 5 women diagnosed with the disease have never smoked also and she speaks of the higher degree of prevalence in women vs. men in the discussion. According to the Uniting Against Lung Cancer Organization, lung cancer will kill more women than breast, ovarian, cervical and vaginal cancers combined. One solution and mission for Ros is to obtain earlier CT screens for the at risk population and she recently lobbied on Capital Hill to get Representative Ross and Senators Rubio and Nelson sign a letter to Secretary Burwell to implement these earlier screenings in medical offices to help eliminate the disease. Ros also talks about the Organization’s annual event, Rappel for Lung Cancer Research. This event, being held December 11th and 12th at the Parmenter Realty Partners Island Center located at 2701 Rocky Point Dr Tampa, has participants rappel down a 13 story office building to raise awareness and funding for lung cancer research. The event last year raised over $136,000 and the goal this year is to raise $200,000. Ros is looking for both ledgers (people that rappel), sponsors and volunteers and you can learn more at http://www.jilliansdream.org! Reach out to Ros at 813-928-7435 or email at ros.miller@jilliansdream.org for more information! My 2nd guest on the program was Ivan Anzulovich, joined in studio by business partner David Sanders. Ivan is a 31 year old young entrepreneur and has been developing business brands since the age of 14. Ivan and I open the segment with a discussion of this first business which was an off road travel business that took riders on adventurous trips through the Argentinian Country, of which he was born and raised. This was a natural spin off business for him as his family was in the car dealership business and was able to obtain 4 wheel drive vehicles for usage. At the age of 16, Ivan hosted a weekend entertainment radio show and then developed “IvanMusic”, a company dedicated to provide music entertainment to private events and to produce music compilations that were sold person to person. His entrepreneurial path progressed as he ventured into the advertising and marketing world with a company called iDeas Territorio Creativo. At 19, Ivan became a distributor of Herbalife and within 2 years at the age of 21, reached the Millionaire Team, meaning he sold in excess of $1M in sales, the youngest person to accomplish this feat within the company. At 23, he ventured into Real Estate development and sold out a 50 unit development in Argentina which inspired him to launch his MyFamily.House brand which gets his attention today. Through MyFamily.House, Ivan works with buyers and investors oversees to get them into their own home in the United States. Ivan explains on the segment the challenges of obtaining financing on homes oversees and that by working with him, he can pair buyers with investors to get them inside their own homes. Ivan is a very diverse entrepreneur and we close out the segment with a brief recap of the business lines he is currently in which include ownership of a Toyota dealership in Argentina, Truth Entertainments, a book and movie creator company in the US, Raices Anz, a Real Estate company in Argentina, MyFamily.House discussed prior and MyBit Farm, a processing data center in the US. David also closed out the segment with a note that they will be coming out with a report geared towards finding investors for the MyFamily.House business and will be available soon on the website. Learn more about Ivan and his many businesses at http://www.myfamily.house and you can reach him at 727-643-3116 or ivan@myfamily.house for more information and ways to get involved with his businesses! This entry was posted in Entrepreneurship and Business and tagged entrepreneur, foreclosures, jillians dream, lung cancer, real estate. Bookmark the permalink.